The King will reply 'Truly I tell you, whatever you did for one of the least of these brothers and sisters of mine, you did for me.'" Oregon has one of the highest food insecurity rates in the United States. When we look at the data, one in five Oregonians faces food insecurity, the inability to get enough affordable, nutritious food, on a daily basis. 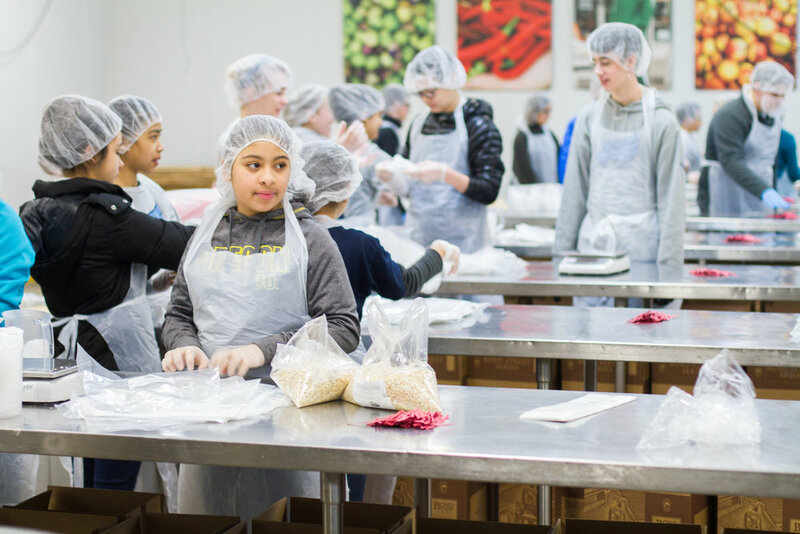 On February 15th, Tualatin Valley Academy's 7th-9th grade students were joined by Scappoose Adventist Christian School's students to work at the Oregon Food Bank. They spent an hour and a half packing oats to be distributed to people in need. 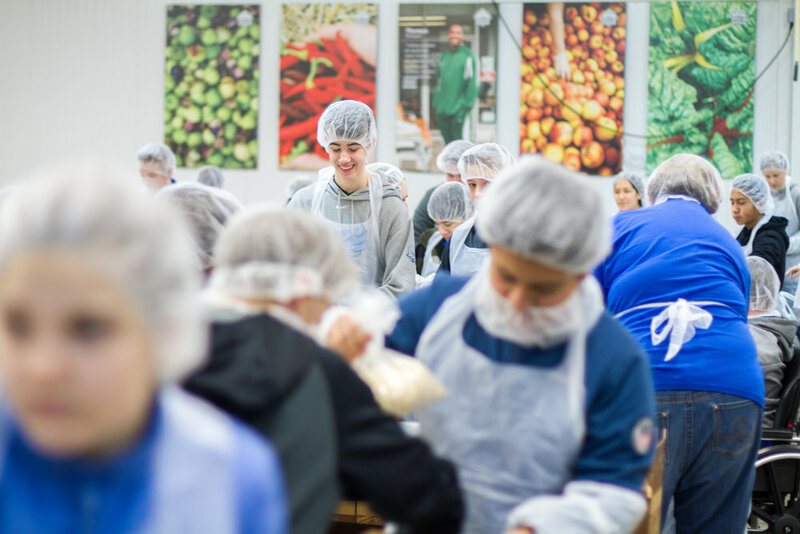 It was an exercise in teamwork, as packing food at the food bank works something like a well-oiled assembly line, but it also opened students' eyes to what they themselves can do to serve others, just like Jesus did. During their shift, students packed 4 pallets of oats into 2 lb bags. They packaged 4983 lbs of oats in total, which is the equivalent of about 4153 meals or 69 meals per student. 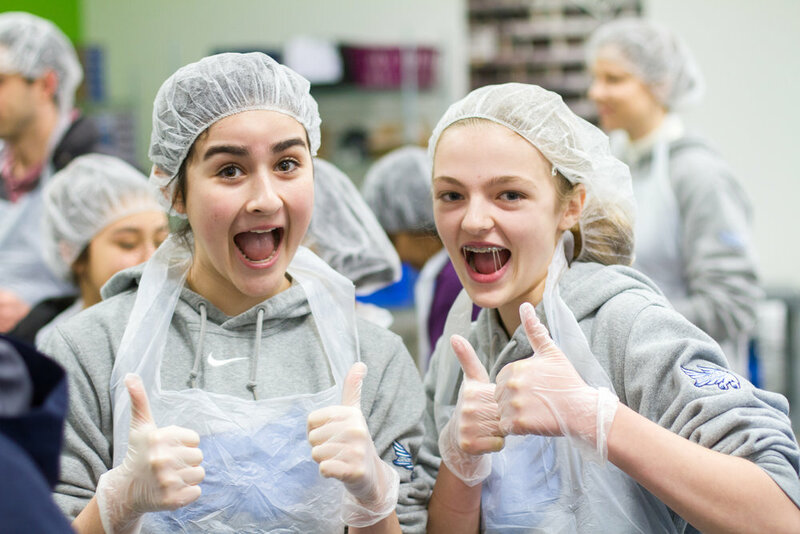 Students were amazed that a hour and a half of their time produced 4153 meals for people in need. That afternoon the students headed over to Beaverton Seventh-day Adventist Church to continue the day of service and teamwork. Students were broken up into 5 groups, each captained by 9th grade students, and rotated through stations. The first station was the church's community center. Students learned about the local and global (ADRA) Adventist mission. The second station gave students the opportunity to journal about their experience, reflecting on what they learned and how they felt about the morning's activities. The remaining 3 stations were team building stations. Students did activities ranging from turning a tarp over with the entire group standing on it to building newspaper tables to support as many books as possible to doing a trust walk. It was a fun day, and one full of learning and reflection. Students gained valuable life skills, and the experience is one they will not soon forget. After a very busy and productive summer, we are excited for the beginning of a new school year! A brand new 50 year roof protects our school from windy and rainy weather. Our front parking lot has been completely repaved with new curbs and striping. A big thank you goes to our Home & School organization and all the students, parents, & friends who supported our Walk-a-thons the last two years! Their efforts have resulted in a parking lot that is safer and of which we can all be proud. Our teachers have been working to prepare their classrooms and are very excited to welcome students back for a new school year! Our enrollment is strong with over two hundred students enrolled. We have two third grade classrooms this year and our ninth grade begins with eight students enrolled. We are very thankful for all the blessings and success we have enjoyed over the past year. With faith and hope in God's continued blessing, we welcome our students and parents to a new school year!